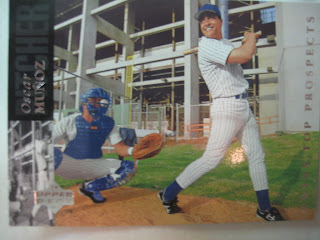 I once wrote about how in the early eighties you often saw cars in the background of spring training shots. Judging by this 1997 Fleer Robinson Checo card, those same cars from the early eighties were still there as late as 1996. 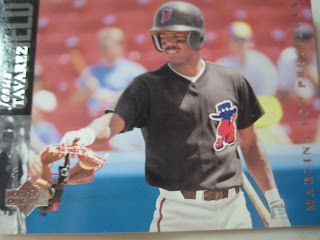 Ozzie Timmons played five years in the major leagues for the Cubs, Reds, Mariners and Tampa Bay. 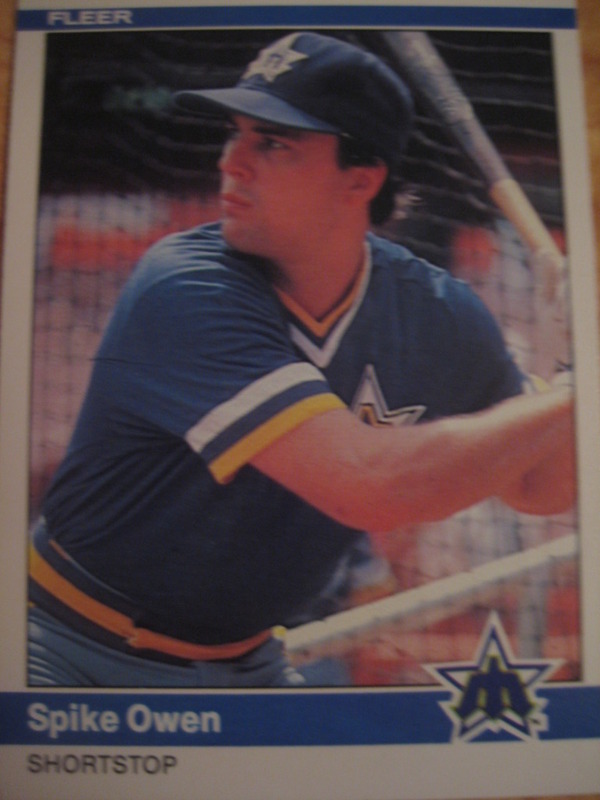 He is now the hitting coach for Tampa Bay's AA affiliate, the Montgomery Biscuits. He kindly shared the following story. "The best story I've got is, one day I did an appearance at an elementary school for some kids and a young girl asked me, why do you guys sign your autograph to a point that we can't even read it? From that point on I have always signed to where you can read every letter in my name. I love to tell everyone that story." 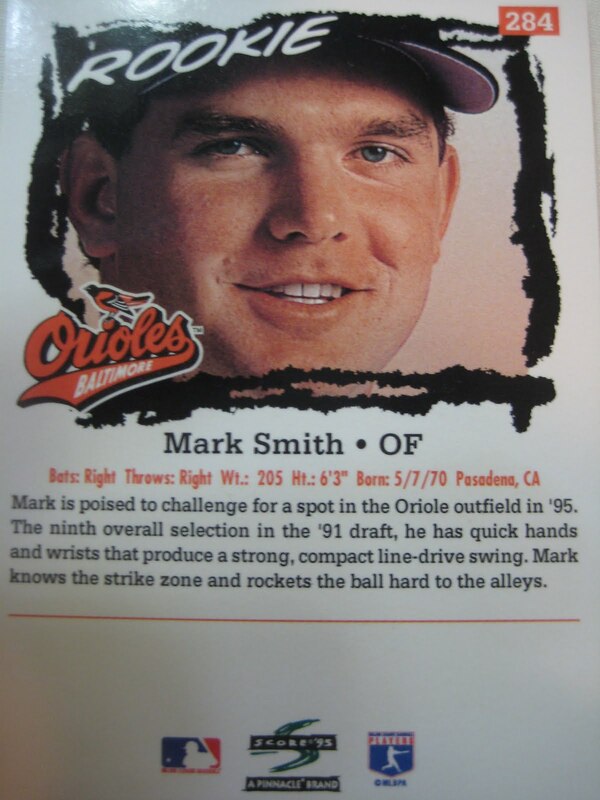 Who's the best looking 1995 Score rookie? Got a bunch of rookies from 1995 Score. So who's the best looking? John Johnstone? Couldn't even bother to shave. 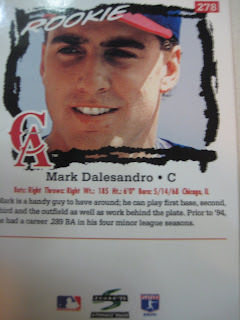 Mark Dalesandro? Needs to wash his face and get rid of that acne. Greg Blosser? There we go. Handsome and rugged, with blue eyes and blond hair. How do I know? It says right there on the card. "Handsome and rugged, with blue eyes and blond hair." 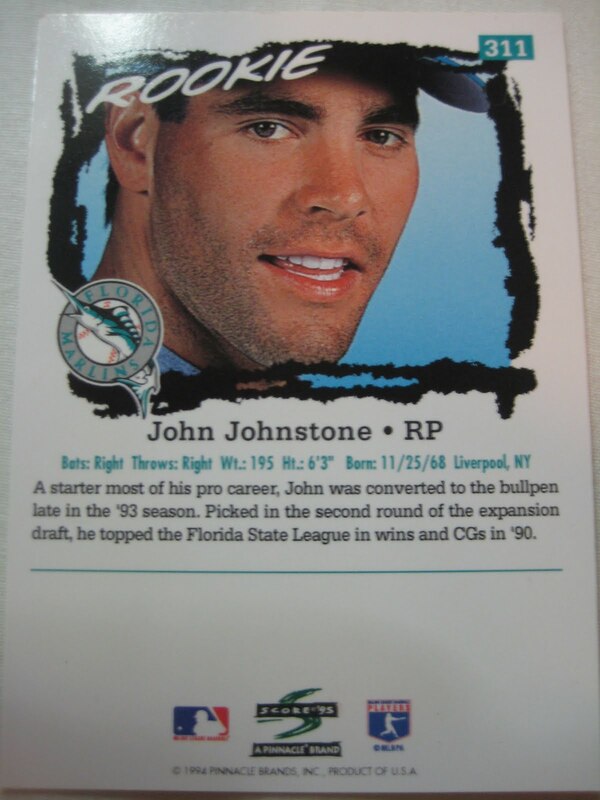 Don't think I've ever seen a player's looks described on a baseball card before. Based on his name, I thought he'd be a five-foot-five, 150 pound infielder. Actually, he was a six foot tall, 195-pound catcher. And he has the pointiest chin in baseball! 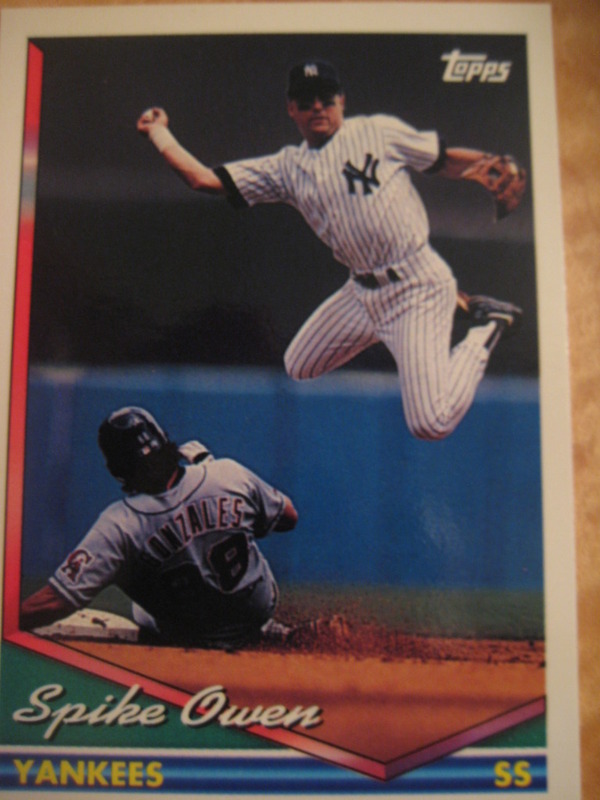 There were some Yankees too, like this great Luis Sojo card. 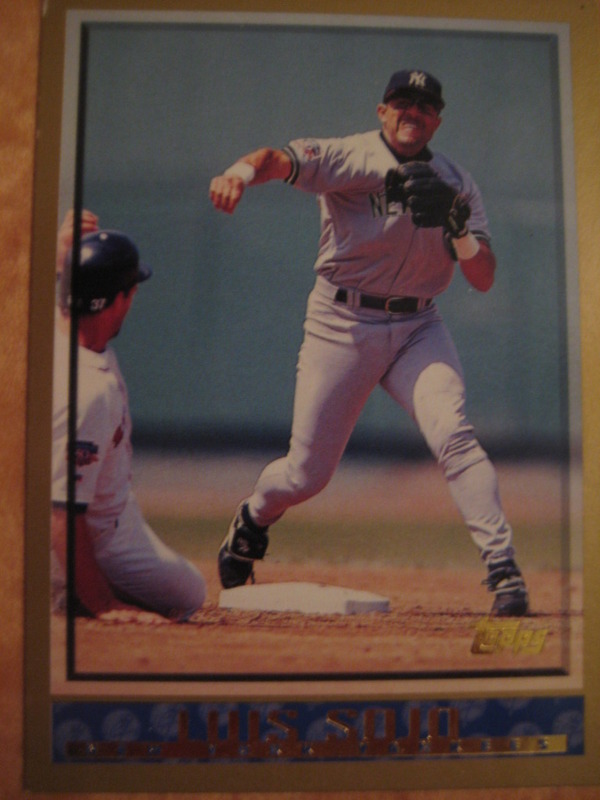 Here's my favorite card of the bunch, one of several Trey Beamon cards in the group. What is he on? An arcade game? A waverunner? Long time friend of the blog SpastikMooss recently sent a trader named Steven my way. 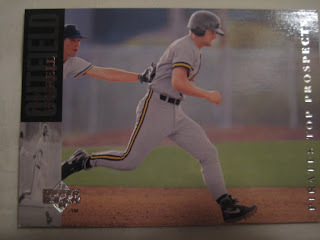 Steven, who does not have a blog, is looking to trade or sell some of his older cards, as he is consolidating his collection to just post-2005 cards. We agreed on a trade and he mailed some cards off to me, then sent me his address so I could mail him his part of the trade. Well, it turns out we both live in the NYC area so we are going to meet in the city later today to give him his cards as well as for me to buy some more cards from him. In the meantime, I got the cards he mailed to me yesterday. 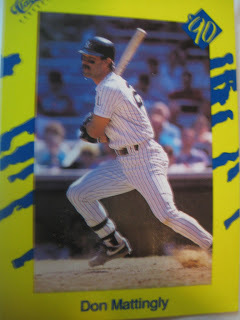 Spike Owen as a Yankee! 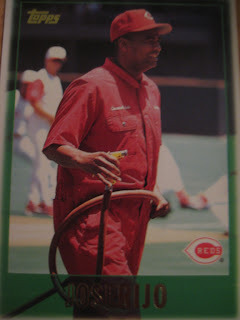 Jose Rijo as a groundskeeper! Billy Wagner as a firefighter! Steve Sparks as a doofus! 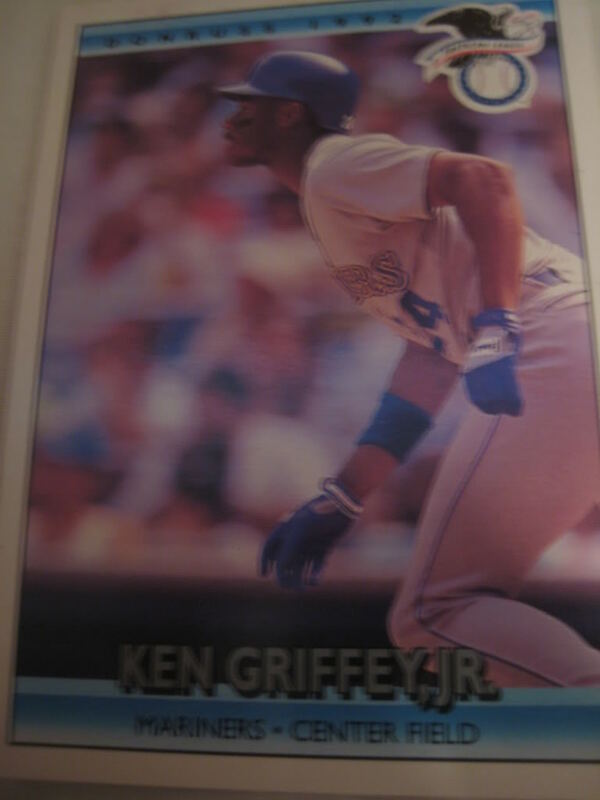 1992 Sportflics Ken Griffey Jr.
How can that be possible, you say? There was no 1992 Sportflics, you say? That is correct. However, Donruss was so lazy in their picture selection for his various cards in 1992, that they all seem to come from the same swing. Let's put them together Sportflics style. I can imagine this as a Sportflics card - can you? Spike Owen played thirteen years in the major leagues as a shortstop for the Mariners, Red Sox, Expos, Yankees and Angels. 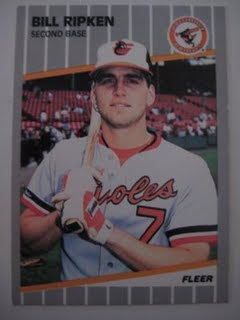 In 1990 he set a National League record for errorless games at shortstop. 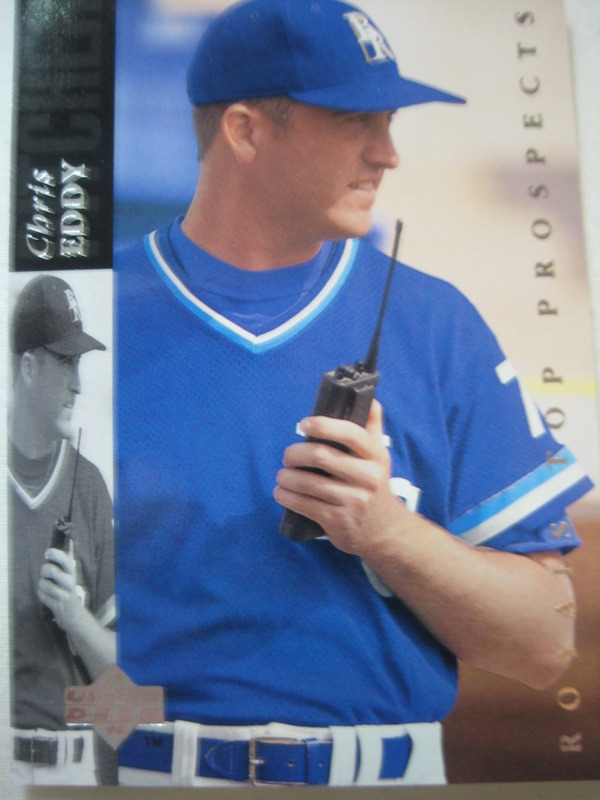 He now puts that knowledge to good use as the Infield Coordinator for the Texas Rangers. 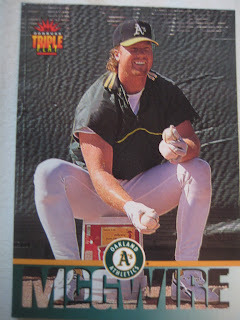 He kindly shared with me his thoughts on baseball cards. "I would say my first card is my favorite. 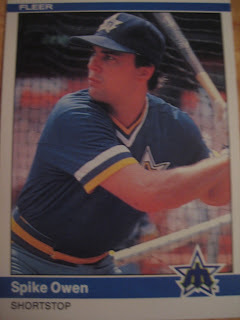 To make it to the big leagues was a dream come true and my first card with the Mariners was pretty special. I did collect the box sets of cards for 84-86. Not sure why I stopped. It has been such a long time since I played I can't even remember a lot of my cards. 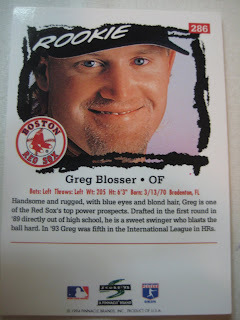 They all were special in their own way and I always looked forward when new cards came out to see what was chosen for me." Thanks! 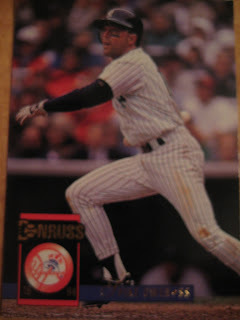 As a Yankee fan I remember him scoring the winning run on a walkoff hit on the last day of the 1993 season, ending that year on a high note and foreshadowing future excitement for Yankee fans. Here he is in pinstripes on a 1994 Donruss card. Went to another garage sale this weekend, and picked up a tupperware filled with several hundred loose cards for $8.00. Awesome! 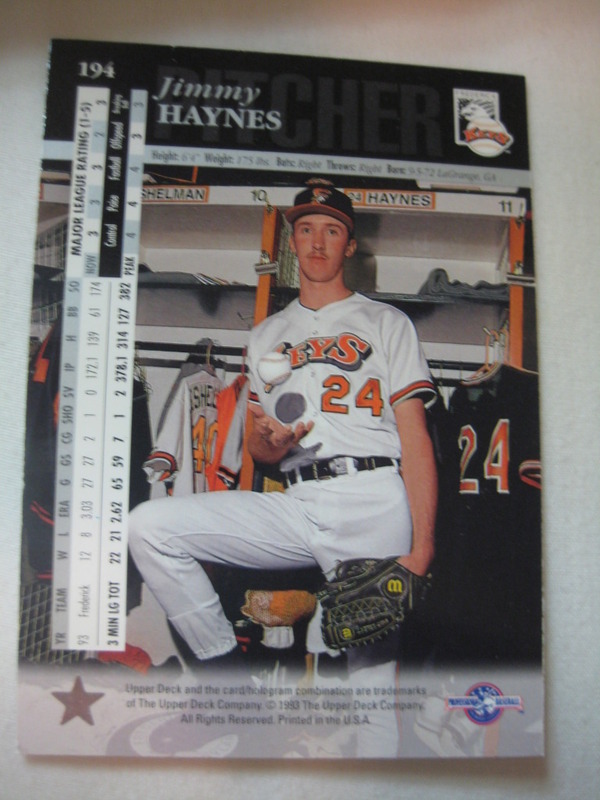 While there were a variety of different cards, like this 1994 SP die cut, most of the cards came from a few specific sets. 1990 Classic Traded (Yellow). 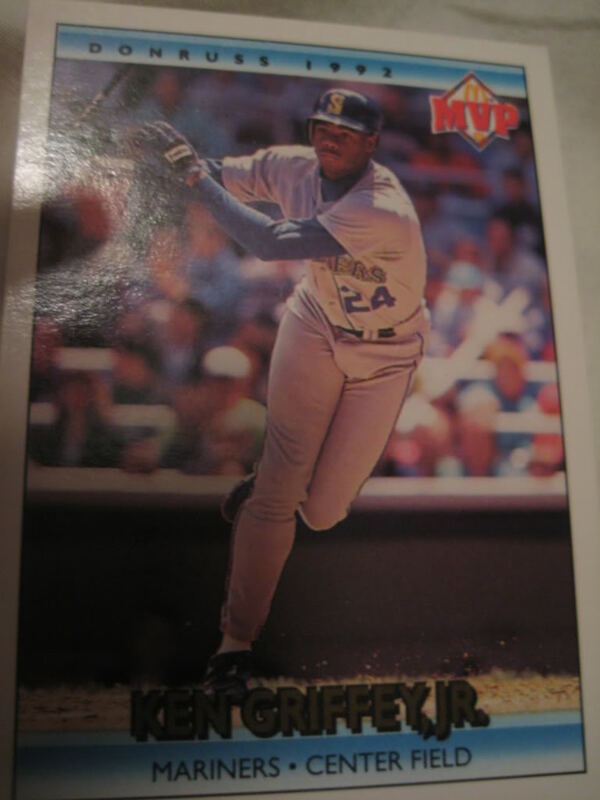 I now need only three of these - Ken Griffey Jr., Mike Witt and Jack Armstrong. 1991 Ultra. 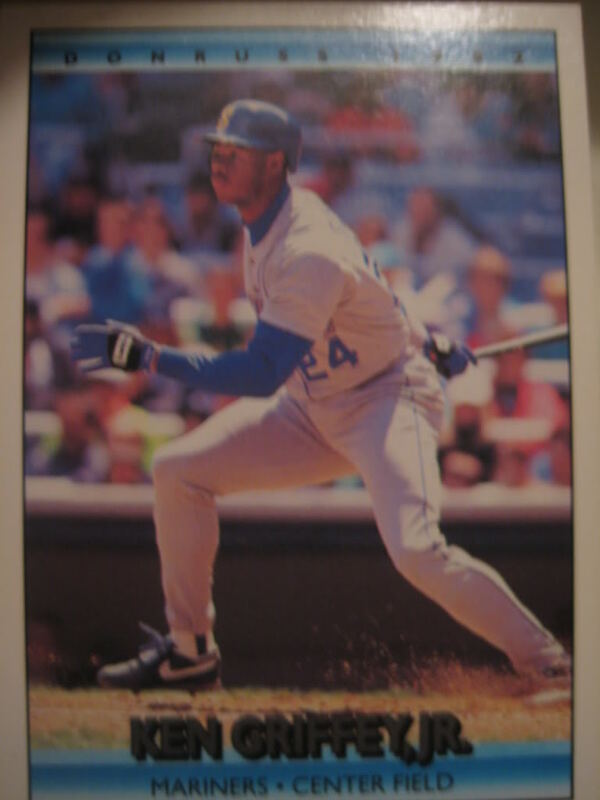 The back of Ivan Calderon's card really caught my eye. With the big Calderon towering over the two little ones in their bright blue pants, I'm strangely reminded of Oompa-Loompas. 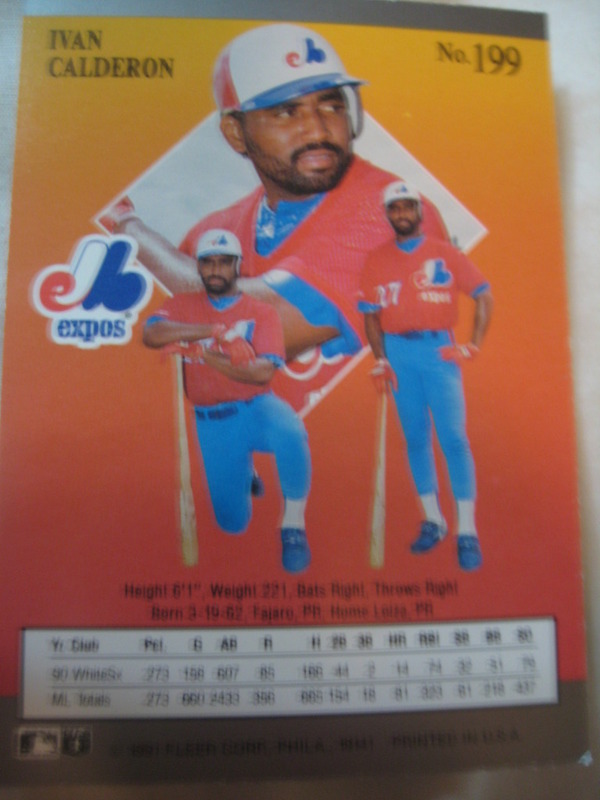 1989 Topps Big Baseball. Some great backs on these! Got some great cards yesterday from Emerald City Diamond Gems. In exchange from a bunch of Mariners, he sent me some great cards! 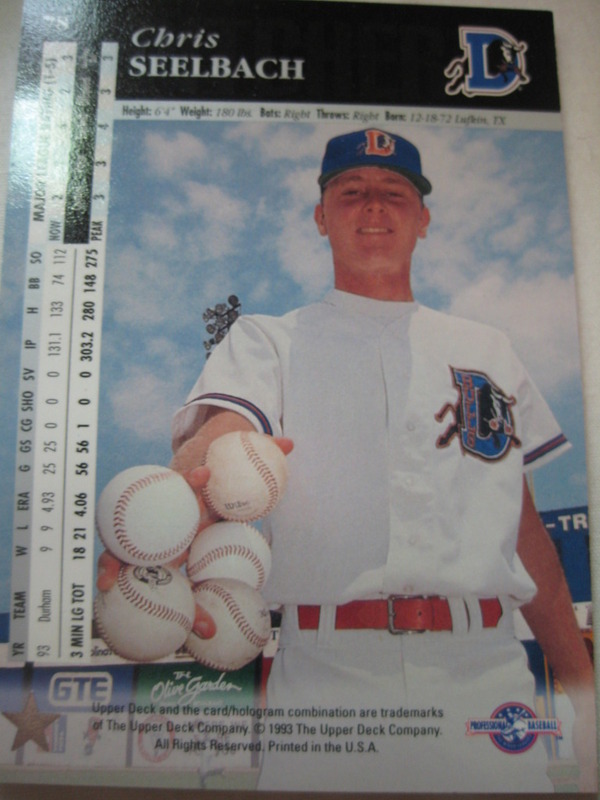 He sent me a whole bunch of great minor league cards. 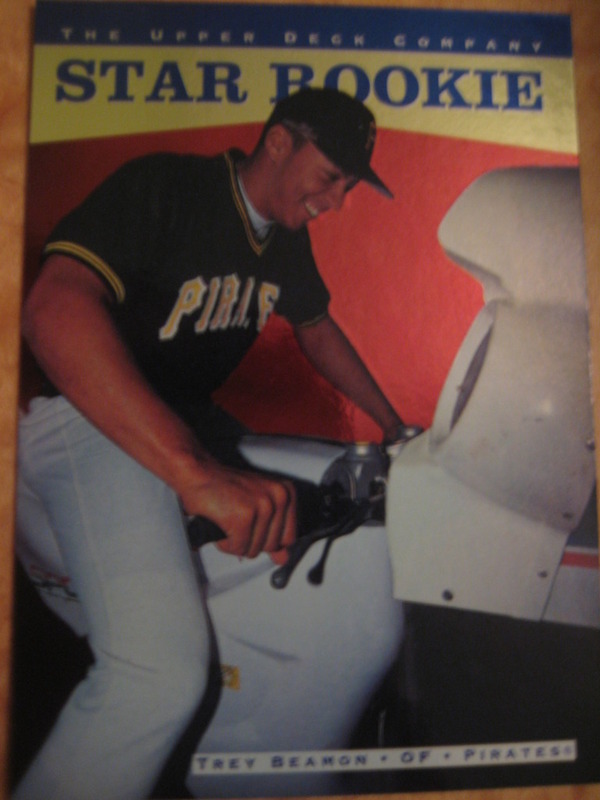 Also a bunch of other things I like such as wacky pictures and early eighties Fleer. 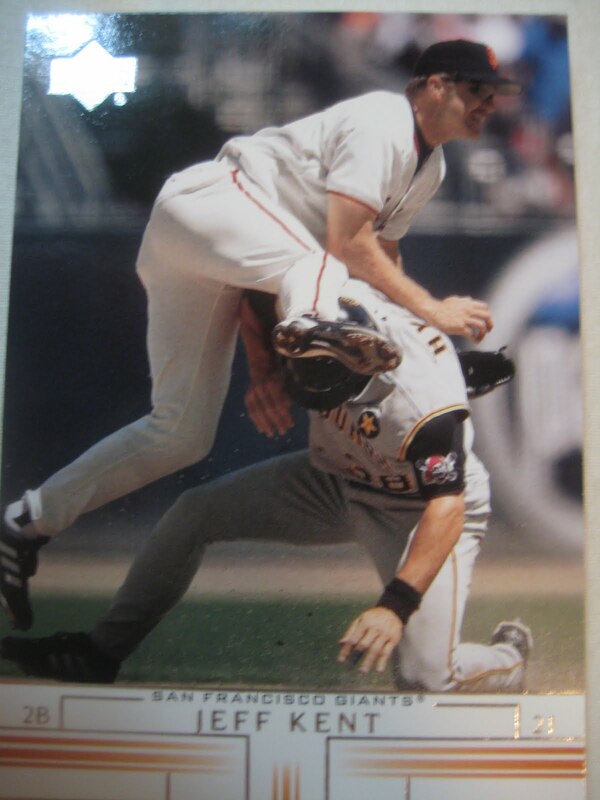 The 1994 Upper Deck major league set had some pictures that captured the craziness of the minor league set. 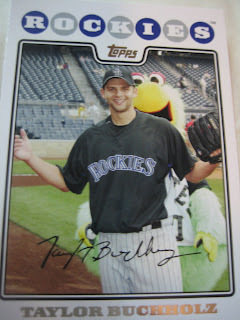 Taylor Buchholz is about to get pantsed by the Pirates Parrot. This is my favorite card of the set. It captures Nick Swisher's personality perfectly. 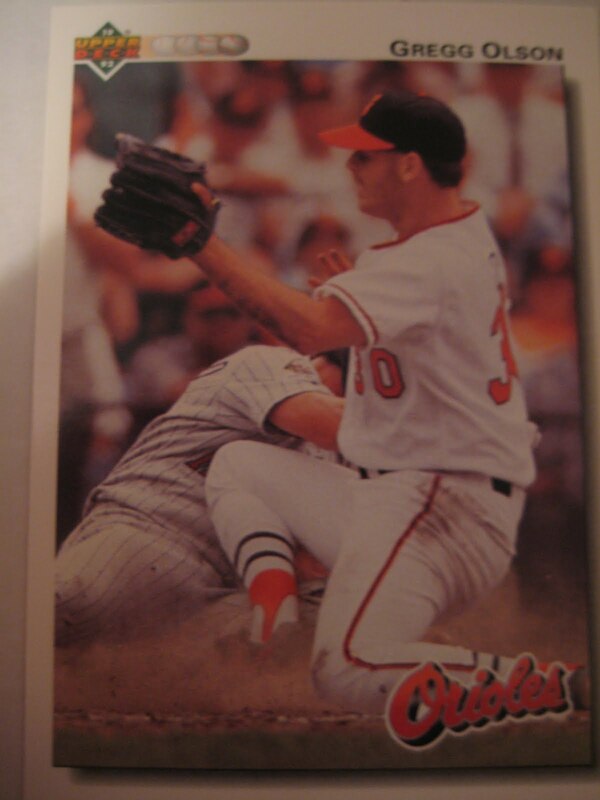 Gregg Olson pitched fourteen years in the major leagues, mostly for the Baltimore Orioles. The American League Rookie of the Year in 1989, he ranks 36th all time with 217 saves. Today he is the Managing Member of Toolshed Sports. The company makes ventilated athletic shorts called "sheds" which are endorsed by baseball stars like Jason Giambi and Mark McGwire. He kindly answered my questions about baseball cards. One of my favorite stories was the Billy Ripken '89 card with the bad name on the bat handle. I still can't believe that made it through editing. No favorite cards. Still hard to look at the one, I guess '92 where I'm covering home plate and Mike Pagliarulo is sliding in (Twins). He could've crushed me. I don't collect anymore, I did when I played. 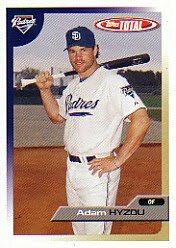 Adam Hyzdu played eighteen seasons of professional baseball, including 221 games at the major league level for Pittsburgh, Boston, San Diego and Texas between 2000 and 2006, hitting 19 home runs in just 358 at bats. 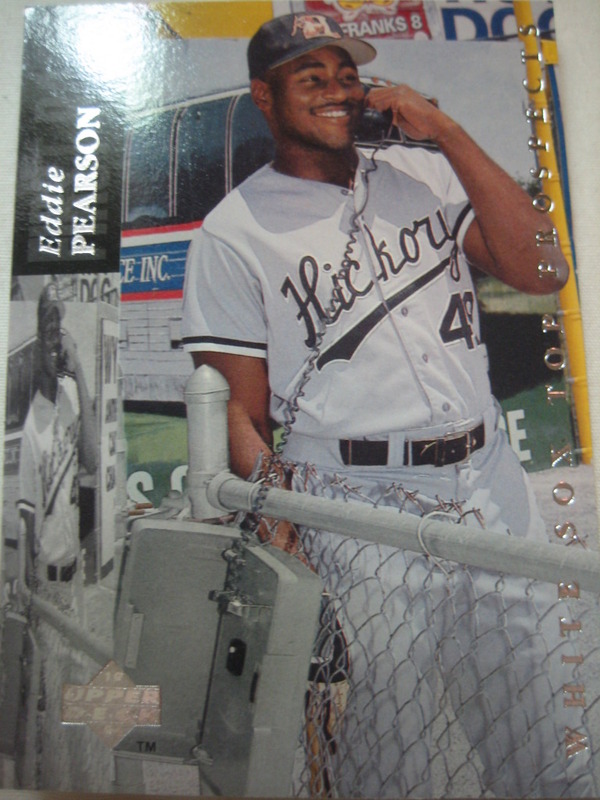 He kindly shared with me some of his thoughts about baseball cards. "The card from 2005 with the Padres was actually taken in Ft. Myers Florida in a Red Sox uniform. Scary what people can do with photos! My favorite card is actually a Jeff Kent card with me taking him out at second base (only homers were more fun) ." Thanks! I didn't have either of those cards, so here is one from my collection, from 2000 Fleer Tradition Update. Matt Antonelli is a second baseman in the Padres organization. 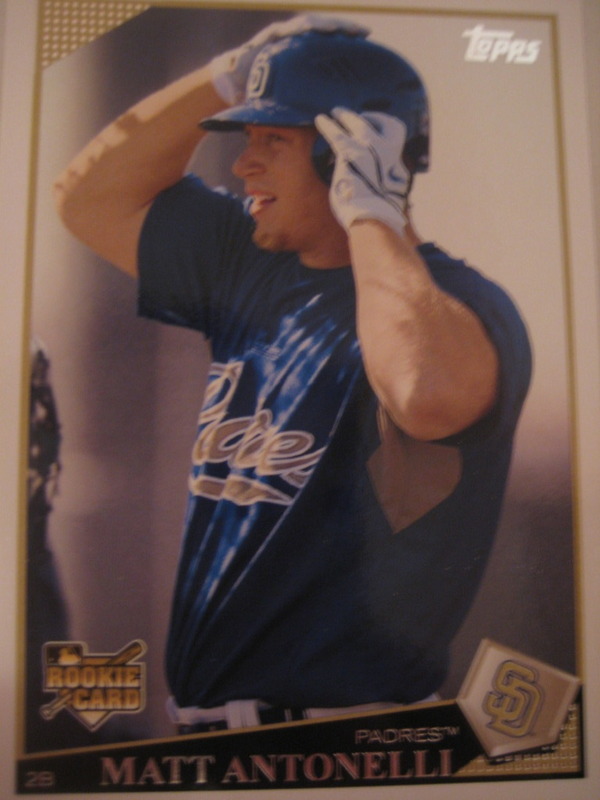 Antonelli, who played 21 games at the big league level for San Diego in 2008, is currently rehabbing from hand surgery but is expected to be playing at AAA Portland by July. He has a great blog at MatthewAntonelli.com. He kindly took the time to answer my questions about baseball cards. 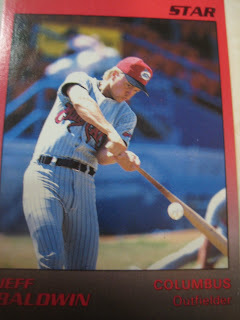 I don't really have a favorite card of myself, but I definitely think it is cool to have the chance to be on a baseball card. I stopped buying cards when I was around 14 years old, but I still have them all. I would guess I have around 2,000 of them. I was a big collector when I was younger. 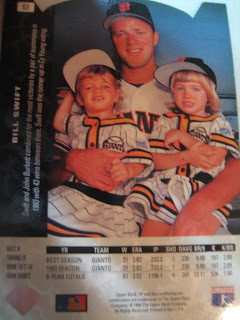 I spent a lot of my parents money buying them. I have a card that came out a few years ago that isn't even me. 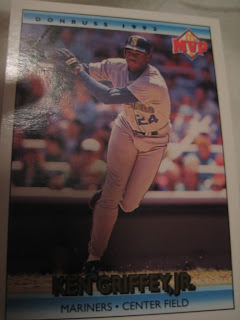 It has my name on it, but the photo is of another player. 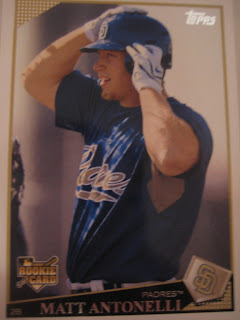 The card is of him hitting, the only problem is that he is a left handed hitter and I am a right handed hitter. Plus we wear different uniforms. Thanks! Unfortunately I could not find a picture of the card he was referring to. Here is a card of his that I do have, from 2009 Topps. 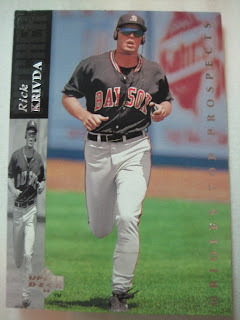 Rick Krivda pitched for the Orioles, Indians and Reds from 1995 to 1998, winning eleven games. 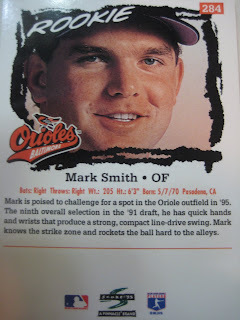 Currently a baseball instructor in the Baltimore area, he is a board member and trainer/coach mentor for the Youth Baseball Coach Association. 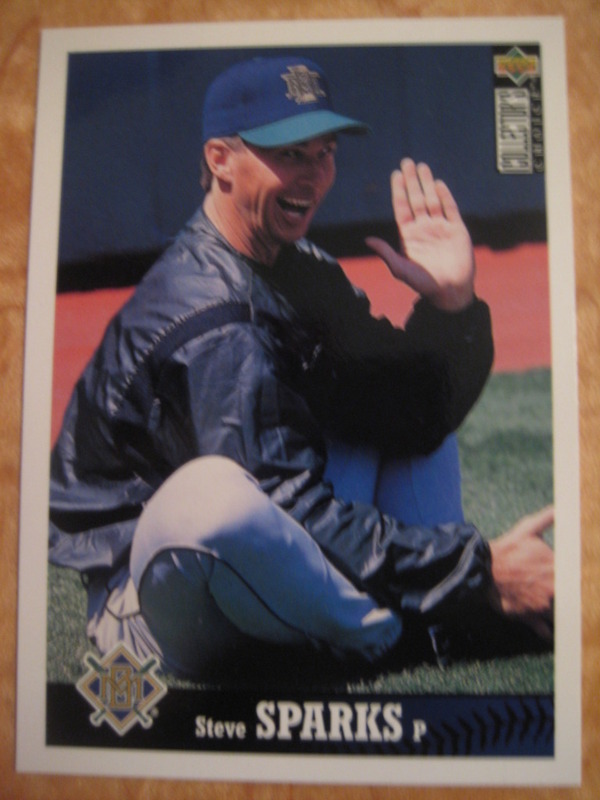 He kindly shared with me some of his baseball card experiences. "I have a liking towards my baseball card while biting a bat...something I was doing while waiting for the shoot. 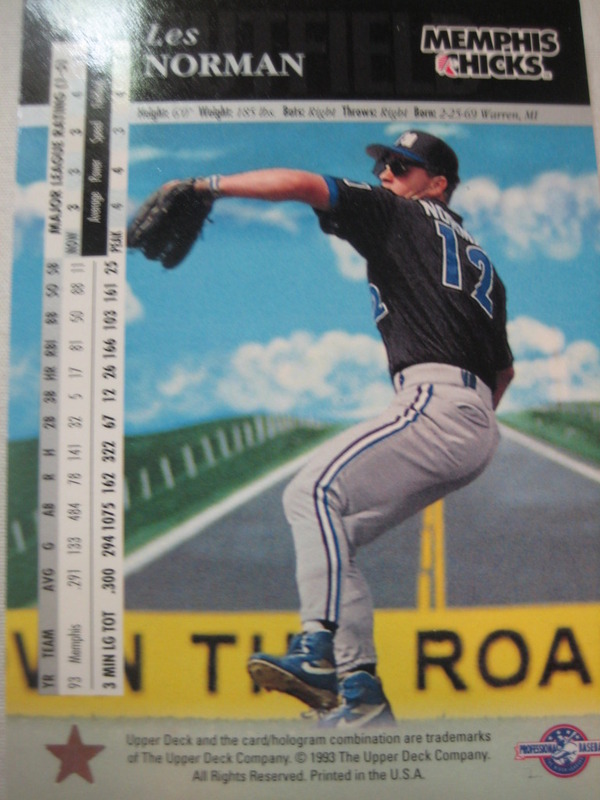 My favorite card of myself is of the 1993 one while I was running in Binghamton,NY running with my "walkman" on. I have an extensive collection of NFL cards from the 70's...O.J., Fred Dryer, Walter Payton to name a few...I have to check the value of some of my 70's and 80's cards. I think I have some complete sets in mint condition. 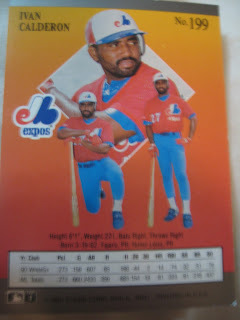 I have mostly football cards but baseball,hockey and NBA." 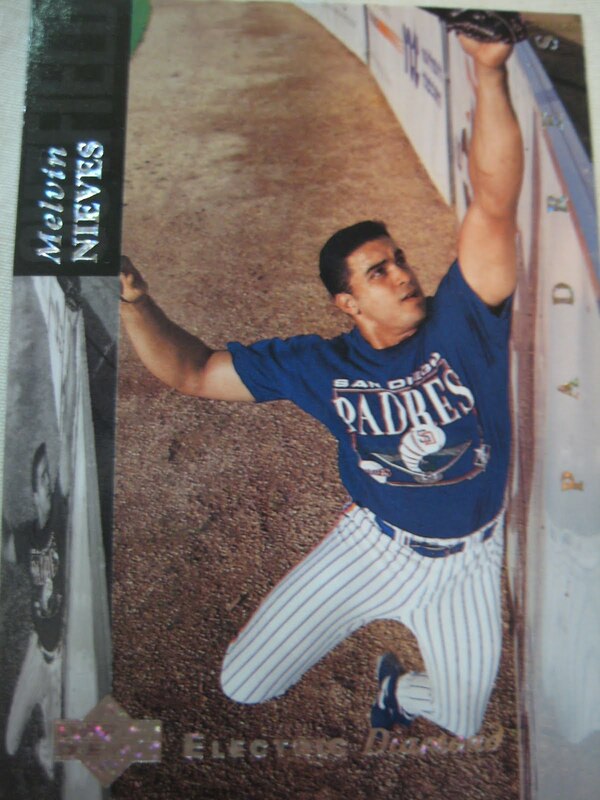 Photos from 1994 Upper Deck Minors didn't have to be wacky to be awesome. 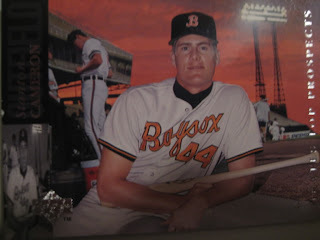 Check out this fiery sunset on Stanton Cameron's card. This one is really poignant. 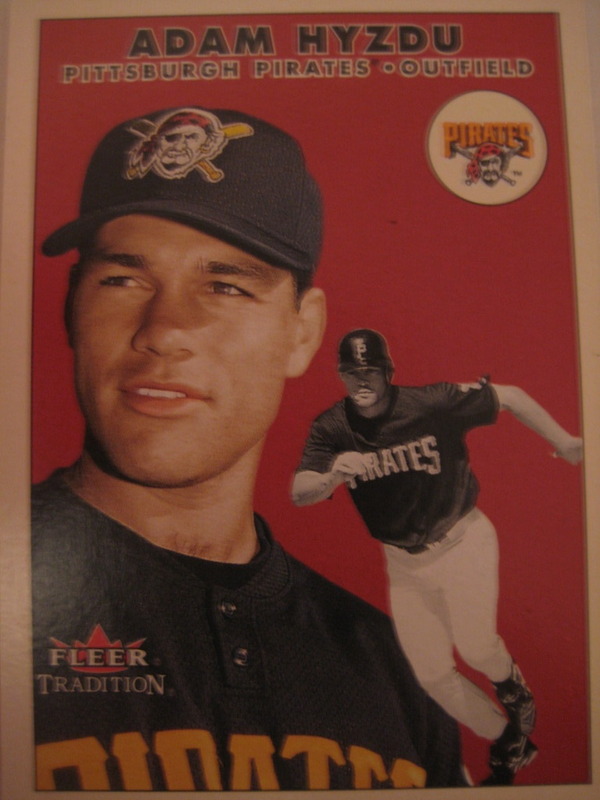 Jon Farrell was the Pirates first round draft choice in 1991, getting him a major league card in the Topps set and a lot of other cards that year, seeming to be a big prospect. 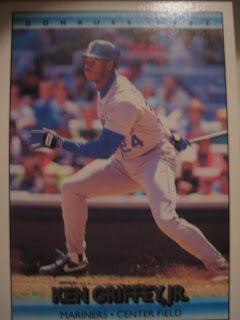 It never materialized, and by 1994 it was already pretty clear he would never live up to the hype. This card really sums up his career. Twins pitcher Oscar Munoz wasn't content to merely pose with a bat. Instead, we see him swinging and missing, a goofy smile on his face. 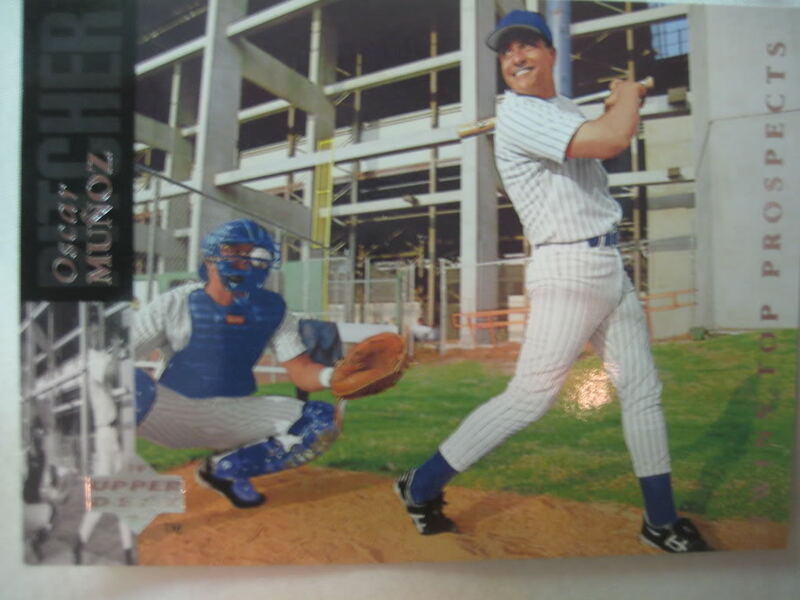 He wasn't even content to have the picture taken on the field, but instead appears to be outside the stadium, or inside some kind of industrial facility or something. But none of that is the best part. Check out where the ball is. Inside the catcher's mask! Ouch! 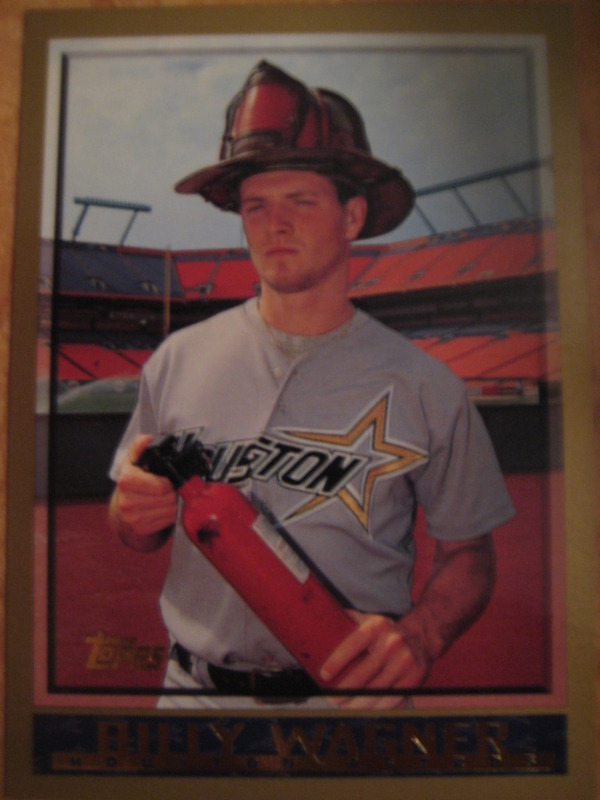 Vaughn Eshelman did not get a card in the 1994 Upper Deck Minors set, but his locker did. Jesus Tavarez seems pretty grossed out to be touching someone's used catcher's mask. That seems like a great way to injure your pitching hand. Here are two pretty cool examples of Upper Deck using advertisements on the outfield wall to make an interesting picture. Les Norman "owns the road". Doesn't he know not to play ball in the street? 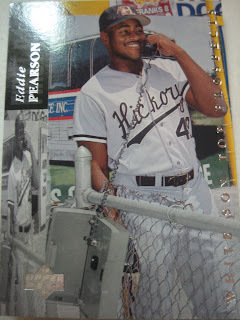 Eddie Pearson almost gets hit by a bus, or at least a picture of a bus, while ordering a pizza to be delivered to the dugout. 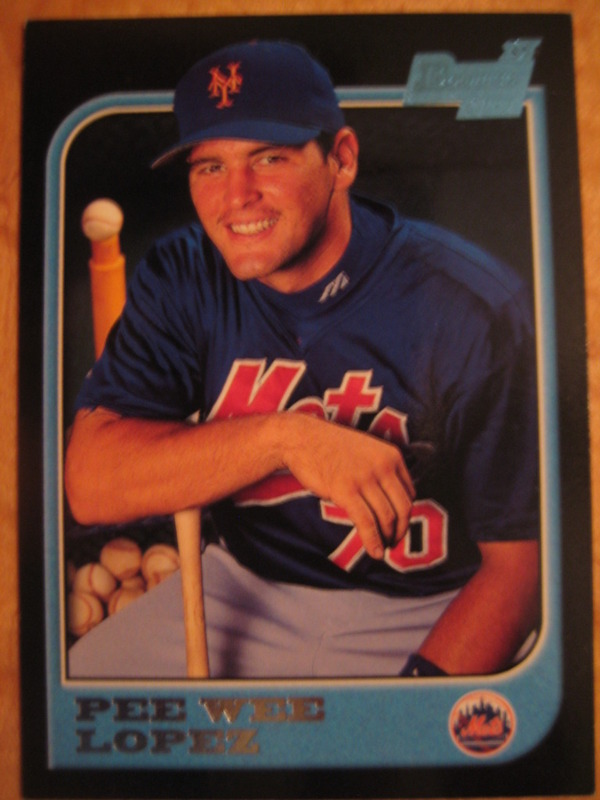 Jason Pierson pitched seven seasons in the White Sox, Mets and Yankees organizations, going 45-34 with a 4.07 ERA. Currently the owner of Foliage Design Systems of the Delaware Valley, which designs, installs and maintains plant systems at malls, office buildings and hospitals, he kindly shared his thoughts on baseball cards. "My fav card was from Prince William, 95 I think. It was a candid shot...I hate posing! 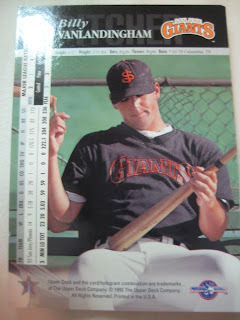 In terms of stories, the only thing I can think of is pitchers that would take their pictures with a bat or guys switching gloves and posing in the opposite wind up." Thanks! 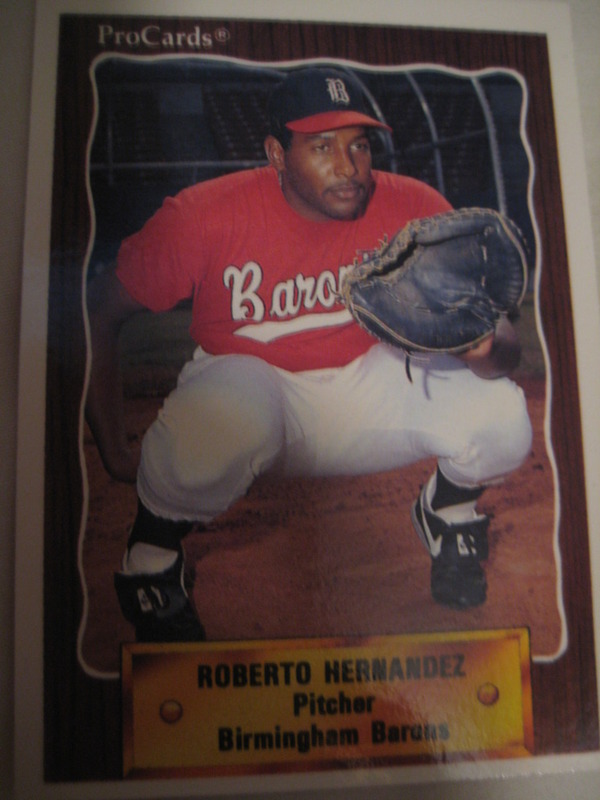 Unfortunately, I couldn't find a picture of any of his cards on line, but here is a picture of a different White Sox minor leaguer clowning around: pitcher Roberto Hernandez posing as a catcher. Tanyon Sturtze pitched 12 seasons in the major leagues. 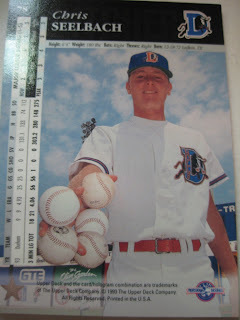 Originally drafted by the A's, he pitched in the big leagues for the Cubs, Rangers, White Sox, Devil Rays, Blue Jays, Yankees and Dodgers. 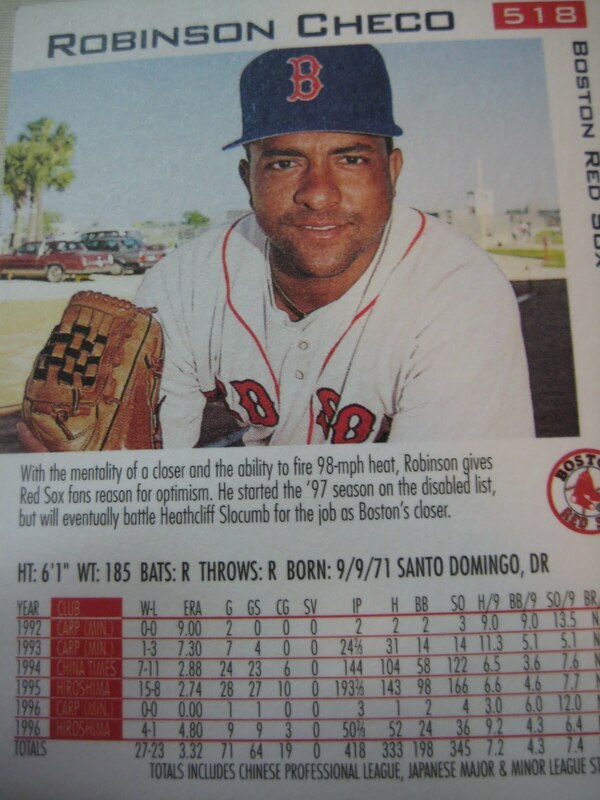 He was a key member of the Yankees bullpen on the playoff teams of 2004 and 2005. 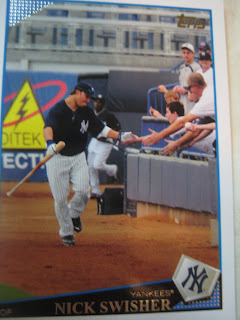 He kindly responded to my request about his baseball card experiences. 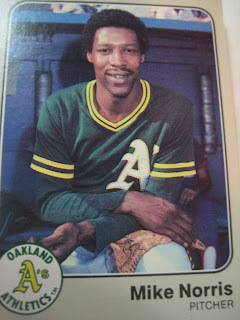 "My favorite card of myself would have to be my A's Bowman card, only because it was my first action shot card. I do not collect baseball cards anymore. When I was a kid it was one of my favorite things to do, I especially enjoyed getting the bubble gum. 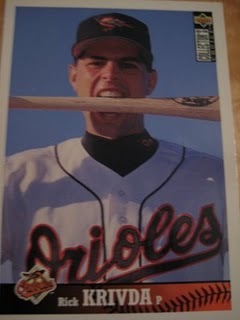 lol I guess thats why I don't collect cards anymore maybe we should bring back the gum!!!!" Thanks! 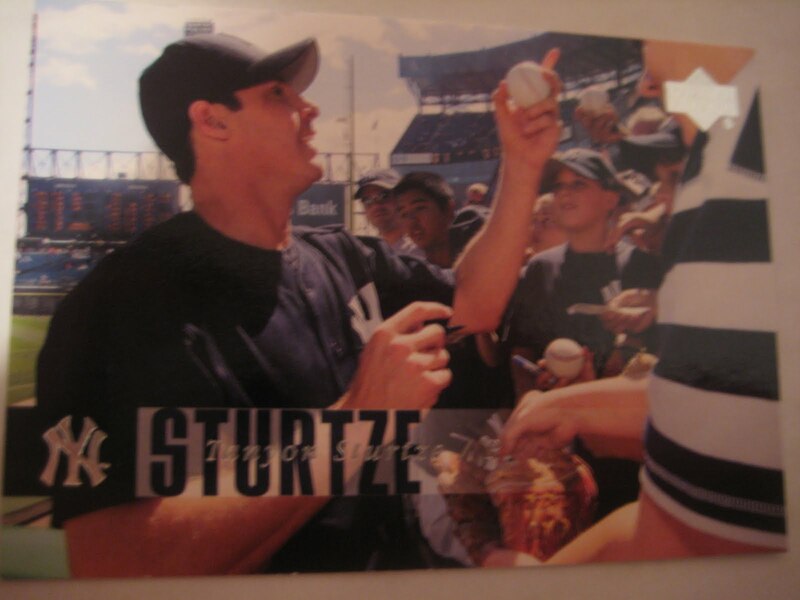 I didn't have that card, so here is a card I have of Sturtze on the Yankees. So what legendary guitarist is Rick Krivda listening to on his Walkman? Eddie VanHalen? Some more Skybox Thunder "raps"
What rhymes with Leiter, Chipper, or Houston?